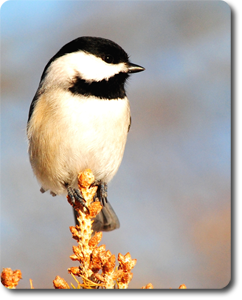 "Chickadee Cutie" The Carolina Chickadee is one of the most special birds that we welcome to thousands of feeders all over the country each year. They are so appealing and their soft warm feathers keep them warm even on the most frigid of winter days. They are 100% pure energy and their Chick-A-Dee-Dee-Dee call is a wonder of Nature and brings any place they call home alive.